The Wolverines maintain a double-digit lead for almost the entire game. ARLINGTON, Texas — Freshman guard Nik Stauskas scored 22 points including six 3-pointers and Michigan is going to the Final Four for the first time since the Fab Five era after a 79-59 rout of Florida in the South Regional final Sunday. The Wolverines (30-7) scored the game’s first 13 points and maintained a double-digit lead the rest of the game against the SEC regular-season champion Gators (29-8), who lost in a regional final for the third straight year. Stauskas hit all six of his 3-point attempts, including consecutive makes from the left corner for to give Michigan a 41-17 lead. 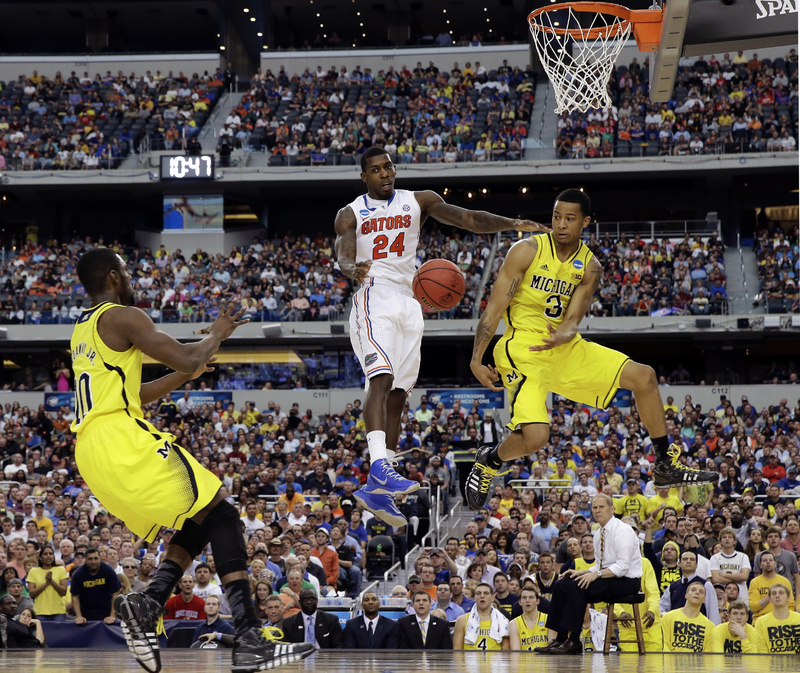 Sophomore Trey Burke, the Big Ten player of the year, added 15 points for Michigan. Mitch McGary, another freshman, had 11 points and nine rebounds. He scored eight in the opening 13-0 run. Kenny Boynton and Will Yeguette had 13 points each for Florida. The Wolverines, with a steady rotation of six freshen and a sophomore, are headed to Atlanta to play Syracuse (30-9) in a national semifinal game Saturday. Michigan hadn’t been to the Final Four since consecutive national championship game appearances in 1992 and 1993, the freshman and sophomore seasons of the Fab Five – Chris Webber, Jalen Rose, Juwan Howard, Ray Jackson and Jimmy King. Webber was gone before that team’s 1994 regional final loss to Arkansas played in the now-demolished Reunion Arena in Dallas, and Howard followed him to the NBA after that. With four wins in this NCAA tourney, the Wolverines already have more tournament victories than their total from the end of the Fab Five era to this season. They had one win in 1998, and then didn’t even make the field again until 2009. Despite being the only team to make regional finals each of the last three seasons, the Gators haven’t been to the Final Four since winning consecutive national titles in 2006 and 2007. Boynton and Erik Murphy, the four-year seniors who came in not long after those titles, will leave without one of their own. They were part of the only Gators class to win consecutive outright SEC regular-season championships, but came up short in the biggest games. After McGary started the scoring with a layup, Stauskas made a behind-the-back pass to McGary for a slam before making his first 3-pointer less than a half-minute after that. Burke passed to McGary for a layup before driving for one of his own. McGary’s jumper made it 13-0 only 3:05 into the game. The Gators were able to recover from an early deficit against Florida Gulf Coast for a 62-50 win Friday night on the raised stage at Cowboys Stadium. Facing Big Blue it was another story. Stauskas, who was 2-of-12 from 3-point range the first three games of this NCAA tourney, couldn’t miss against the Gators. The 6-foot-6 guard from Canada put the Wolverines up by 24 points with 4:08 left in the first half after two consecutive 3s from the left corner in a span of 27 seconds. Like he did on all of his makes, Stauskas came back down the court with a smile on his face, sharing the moment with the Wolverines fans who made the trip to North Texas. Florida missed its first seven shots before Will Yeguete made a layup more than 3 1/2 minutes into the game. It was a rough finale for Murphy, who twice thought he had easy baskets in front of him only to have the shots blocked. Murphy had eight rebounds, but finished 0-of-11 shooting and was scoreless for the first time this season. Even with an 11-2 run late in the first half punctuated by Boynton’s 3-pointer, the Gators were still down by 15 with a minute to go in the first half. And the Wolverines were able to score even after it appeared that the half had ended – Burke was already started heading off the court pumping his right arm toward the Michigan fans. Stauskas was fouled on a 3-point attempt with .4 seconds left and, after officials reviewed the play, hit two free throws to give the Wolverines a 47-30 lead. It was that kind of day for Michigan, and for Florida.